The Placitas Library Garden is a wonderful volunteer opportunity, especially for Master Gardeners who live in Placitas, but others are welcome too. The library, in its present location, opened in 2010 as a volunteer- run library. It now has a paid librarian position. The landscaping was designed to focus on native plants and be a garden where the community can see and learn about the plants that grow well in this area. 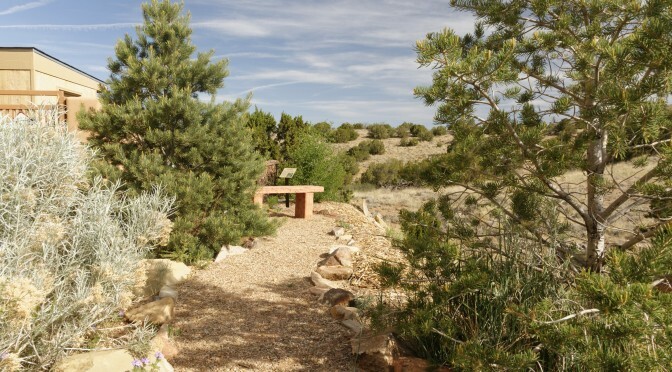 An area near the building was designed, donated and installed by David Salman of High Country Gardens. That area is full of flowers and truly beautiful. Signs have been installed identifying some of the plants and we hope that there will be more in the future. The installation of the initial garden has been completed, so now volunteers are needed to help with the upkeep of the garden. The work includes pruning, weeding, watering and fertilizing. There may also be some planting in the future, as plants are donated or replacements are needed. The pruning is done in the spring and the fertilizing in the fall. We usually have work days for these activities and encourage participation by Master Gardeners. Weeding is done throughout the year, as needed. We have divided the garden into zones, with volunteers having their specific zone to maintain at their convenience. We could use more volunteers willing to work on a zone, and we’ll be needing volunteers in the fall to fertilize. The date for that will be decided closer to that time of year.